A great article from the AIM ntework – Author David Tyler | Townsville Blog. Trending Issues: Achievable Indigenous Reconciliation? The AIM NetworkNews and PoliticsHMAS Chum Bucket almost scuppered in a week of scandal and self-sabotage. HMAS Chum Bucket almost scuppered in a week of scandal and self-sabotage. David, for a bloke with as little formal education as I have, it is difficult to express how much I loved this article,. So many nails hit on heads, congratulations beautifully written. Ita Butrose likely to be head of ABC. Liberal politicians and Coal industry types have always been whingeing about the efficiency of port operations, during the 1980’s many were filmed at Newcastle beaches pointing to the armada of coal ships on the horizon. “This is because of the unions and over-regulation” they would explain, but there are only so many ships you can have through a port in real-time. Its NOT a conveyor belt. Someone has resurrected this meme, but now they are whingeing about coal ships dwelling at the delivery end. I of course will be voting Labor in the House, and Green in the Senate, for two reasons. Firstly because there is no competition to Labor in the House, and like the first paragraph, Labor does not in Queensland at least recognize any employment below school teacher, it’s as if those of us who have been clerks, shop assistant’s console operators 9service stations) don’t exist. And secondly Green in the Senate, because as we have seen from the current crop of dirtbags, power corrupts, and absolute power corrupts absolutely. David, may I copy and paste this article to my blog for future reference? No problems, Shaun as long as you acknowledge where it came from. His desperation is like a choking cloud of a herd of cows in your lounge room all farting at the same time. David what can I say…you sure have a way with words, and with those words I can see a strong bright light at the end of this very long dark tunnel we have been forced to live in. Fantastic article, I salute you! This is what Scotty is famous for. Great article David. Thank You! I note Scummo is giving the ineffectual “Emissions Reduction Fund” a new monicker – just what you might expect of a cluey, over-excited, shouty and failed advertising guru. Like the old ERF the new “Climate Stabilisation Fund” will shovel public money to National Party supporting farmers not to clear that patch of mulga scrub they were never going to clear anyway. Like the ERF providing Bunnings funding to change its lights to LEDs or whatever, the new CSF will fund business mates to replace their clapped out air conditioners and appliances. As in the Helloworld scandal the CSF is just another scheme to transfer public money to “MATES”. Damn this autocorrect! “patch of mulga scrub”. And I note the CSF has been reworked to the “Climate Solutions Fund”. Clever of Scummo don’t you think? 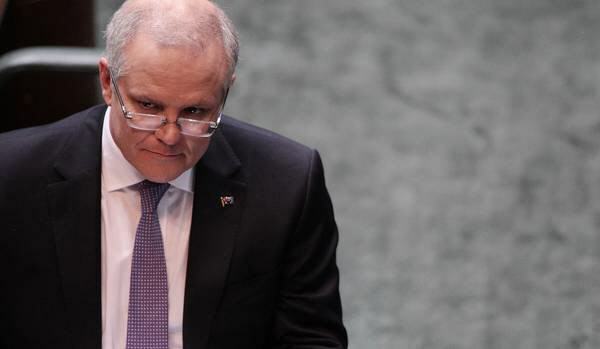 Scummo has ‘saved’ the Villers Bretonneux Dawn Service, the push for a later time (10.00AM) was scuppered by our brave PM, because he is right. No other reasons needed by our vigilant Shouty McShout Face. The art of politics is a refined and nuanced thing. Chum; one’s friend or companion thrown overboard to attract sharks. With hearts devoid of anything but malice towards the wider public, the single remaining option is smear and agitprop to manufacture consent for more corruption and authoritarianism. I was shocked when I saw that Ita has a chance to become the head of the ABC…. Thanks also to my favourite Labor politician, Dreyfus, for Chum Bucket…. Peterson is to Canadia as Andrew Bolt is to Australia….